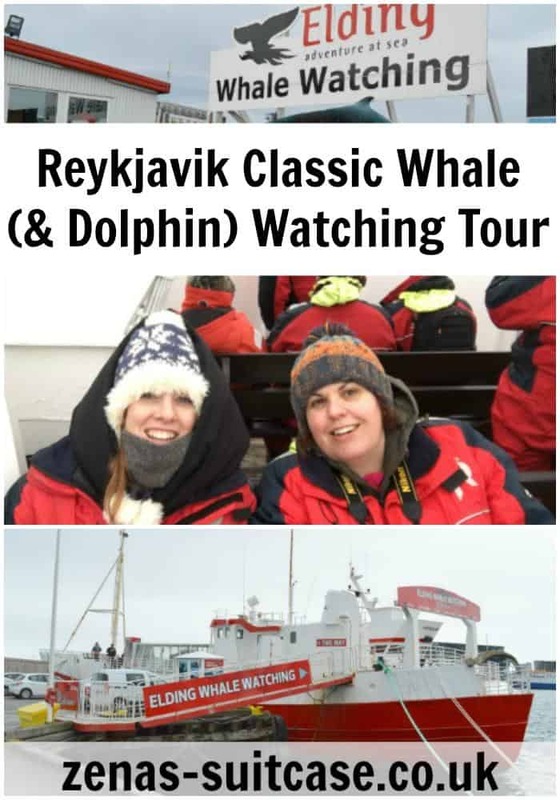 When I heard about the Elding Whale & Dolphin watching tours from Reykjavik I knew that it was something I wanted to do. Going to Iceland is as much about exploring the country as it is about exploring the North Atlantic and I wanted our adventure to feature a trip out to sea. I was so excited about getting on board the boat and what we might discover on day two of our holiday. The possibility of seeing a whale or dolphins in their natural environment was something I had been looking forward to from the moment I booked the trip. My sister had been to dana point whale watching and said she really enjoyed it, so when I saw I had the chance to do it in Iceland, I jumped at the opportunity! 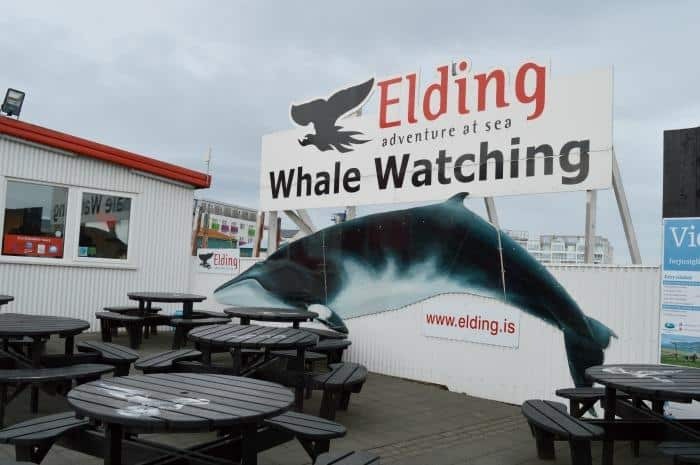 Elding is a responsible whale watching tour operator with many years experience running these kinds of trips from the Old Harbour in Reykjavik. Before joining the boat there is a shop and exhibition centre that gives you some more information about whale and bird watching around the North Atlantic. On board the ship we were joined by a scientist who provided us with tips like how to notice there is a whale or dolphins nearby. For example, you might see birds circling or breaks in the water against the natural tide. I would recommend getting to your whale watching tour early if you would like to sit down for at least some of the trip. We were able to sit down on the top deck, but when things got exciting in the water everyone was soon moving around to get a glimpse of what was happening out at sea. 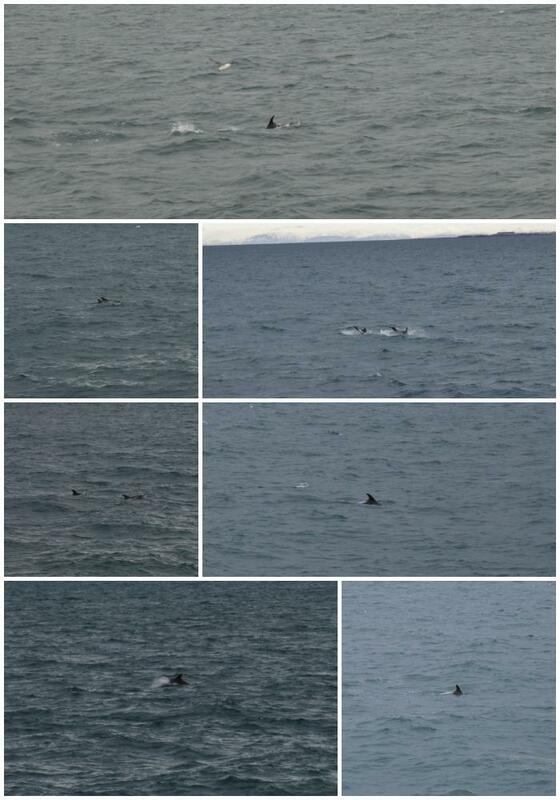 It took around 25 minutes before we saw our first sighting of the white beaked dolphins. They literally surrounded the boat at points, and were leaping out of the water. We were told there were several pods in the vicinity and we could see that some had calfs with them. We used a clock system to establish where the dolphins were in relation to the boat but everyone got a great view of them as there were just so many. The estimate was around 40 during the trip. At points the white beaked dolphins were literally metres from the boat, with some swimming directly underneath us. Being so close to them in their natural environment was just mind blowing. 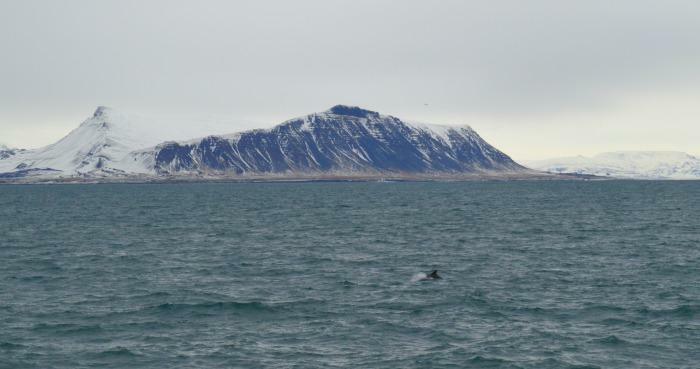 We enjoyed some very exciting dolphin activity for around an hour, which made for a really breathtaking trip. When things calmed down a little in the water, we were able to enjoy the beautiful scenery and even grab a snack or two on board the ship. We didn’t have to worry about being cold either, as Elding provided us with overalls which were perfect for dealing with the colder weather out to sea. To really enjoy this trip, I would strongly recommend wrapping up warm. Do not worry about what you look like, as in Iceland everyone is really laid back about clothing. Make use of the overalls provided or you could end up looking like the odd one out, and being cold will really put a dampener on your tour. We weren’t lucky enough to see a whale during our excursion, but the landscape and dolphin activity we saw were just amazing. If you are visiting Iceland to enjoy the natural environment I think a whale watching tour is an essential part of your itinerary. The North Atlantic and Iceland have such a close relationship that a tour like this will help you to appreciate their long standing connection. 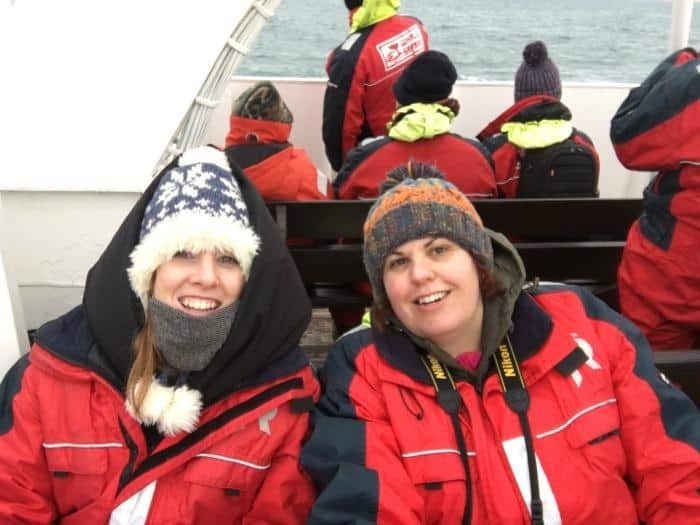 Elding whale watching tours are well run, safe and they are also really enthusiastic about giving you the best chance of seeing what lies within the North Atlantic. Our guide talked with such enthusiasm about the dolphins activity that it was hard not to find this infectious. She was also happy to answer any particular questions the guests had and talked about the Icelandic landscape in general. 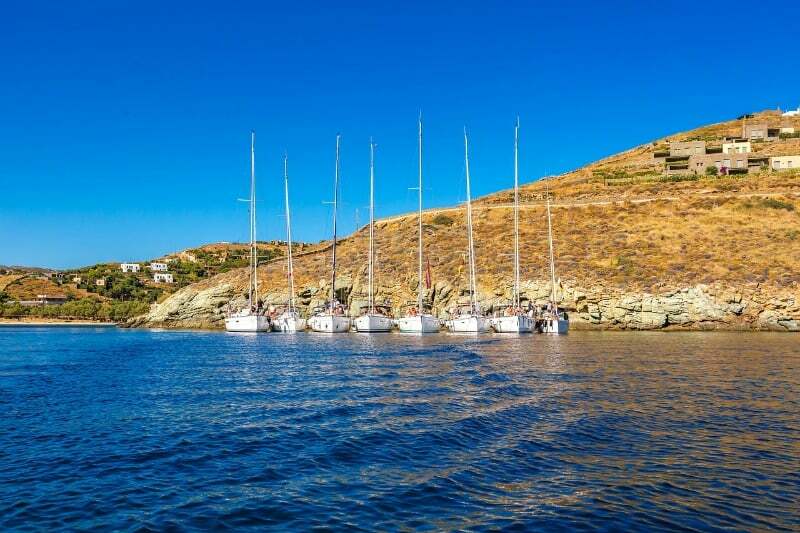 We had a great experience with Elding, and they even offered us sea sick tablets before boarding as they thought it would be choppy out at sea. Fortunately it wasn’t as bad as they thought it was going to be and I found I didn’t need one. 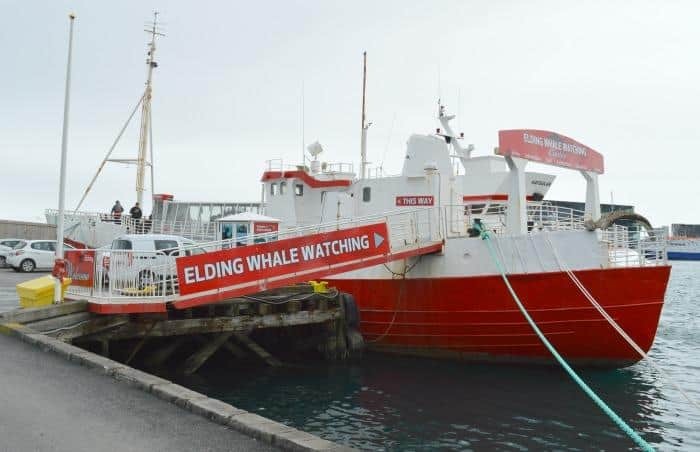 If you are looking for a whale watching tour to book whilst you are in Reykjavik or Iceland, I would have no hesitation in recommending Elding to other travellers. Looks amazing! Definitely something for my bucket list! Glad you enjoyed it. I have been whale watching before a couple of times, in sunny warm places. Even then it was very cold at sea. What an awesome experience, something you will remember time and time again. I love that they give you coats etc to keep you warm on the trip. Sarah | Boo Roo and Tigger recently posted…What was your last #railadventure? 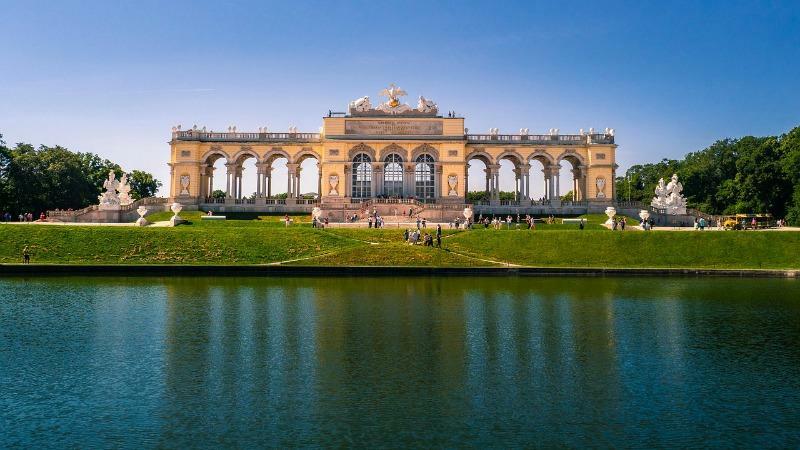 This trip looks so exciting. I have wanted to visit Iceland for a long time.